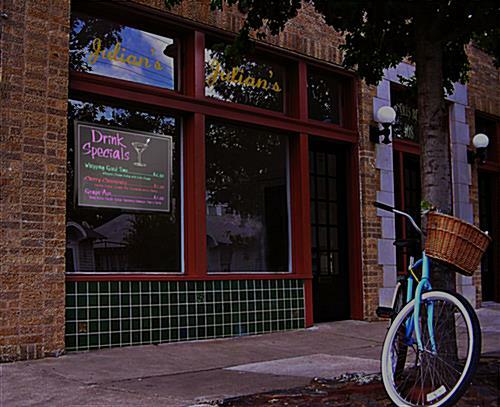 These Retail Sign Supplies For Businesses Feature a Unique Shape That Works in Portrait or Landscape Orientation! Shop From Hundreds of Models of Sign Supplies In Our Large Online Catalog! 24"w x 32"h writing surface for writing many menu items! 17 light effect settings give users many display options! Includes hardware for wall-mounting or ceiling suspension! 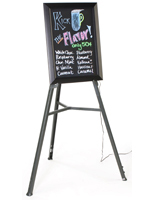 Bright fluorescent colors offset black dry erase board to attract attention! 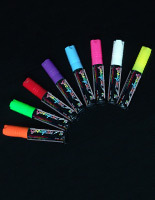 Designed for use with wet-erase or liquid chalk markers - sold separately! These LED writing boards with seventeen light settings are designed to get your messages noticed, with bright illumination! 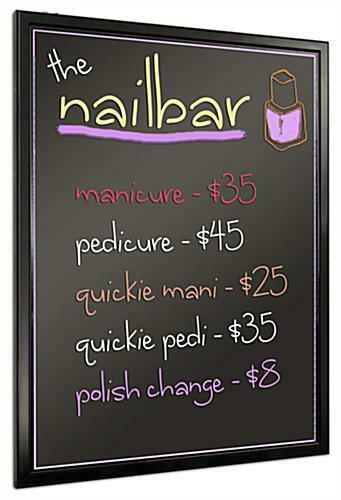 These write-on signs are great additions to any establishement, as users can easily write their own messages in minutes. 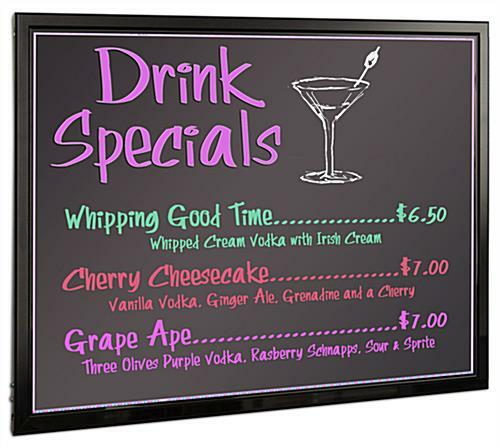 These large LED writing boards, also known as menu displays, feature a black markerboard surface with edge-lit technology. The design of these frames features a light channel around the inside edge of the frame, and have a strip of lights on each of the longer sides to illuminate messages. These units are perfect for writing menu items, displaying specials in a restaurant, or to advertise upcoming events bulletins in retail stores. These wet-erase signs, LED writing boards that light up feature red, blue and green lights on both of the long edges of the markerboards to illuminate written text and graphics. 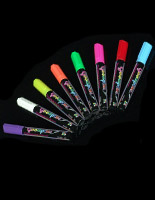 Once connected to an electrical source, a user can choose from 17 different neon lighting effect settings. 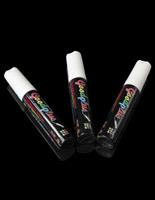 The use of wet-erase or liquid chalk markers is recommended to create your own custom message. 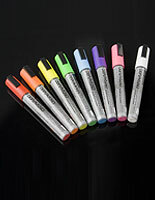 Although any color marker will work, a white wet-erase marker will produce the most vibrant color effects once the LED writing boards are illuminated. Users can also try different colors to see which achieves the appropriate effect. 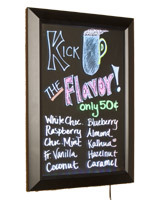 The LED writing boards that illuminate feature a beveled black frame for a classic appearance. The frames increase the attractiveness, without detracting from the written messages. These LED writing boards that flash are sent with hardware for either wall-mounting or suspension hanging. Electrical Cord Length: Approximately 10 ft. Please Note: These frames include hardware for wall-mounting in both portrait and landscape format, as well as a black chain for suspending from a ceiling. 31.5" x 23.8" x 1.0"